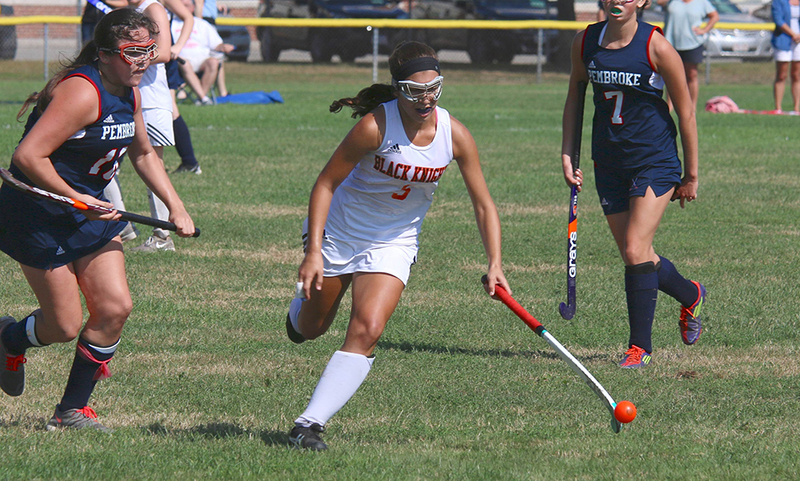 Below are the official Hockomock League Field Hockey All Stars, selected by the coaches in the league. MANSFIELD, Mass. – The Panthers had dominated from the beginning of the game, forcing Mansfield to defend deep and putting consistent pressure on the Hornets’ back line. Then, with a minute remaining, Mansfield broke forward on a rare attack on the Franklin net. Franklin goalie Sam Jones made two kick saves, but in the mass of white and blue jerseys in the crease she was forced to cover up the ball to prevent a goal. The result was a penalty stroke with just 40 seconds left to play. Mansfield junior Caitlin Whitman stepped up to the spot. The Hornets had been practicing and Whitman put the effort to good use, dispatching a shot into the bottom corner and past the outstretched leg of Jones. The goal gave Mansfield a 1-0 win on Wednesday afternoon at a rainy and cold Alumni Field, decided the season series between the rivals, and advanced the Hornets to the Div. 1 South final. “We always have a plan when we step up to the line,” said Whitman, who admitted that she had put in a lot of time practicing penalty strokes in the lead up to the game. The Panthers jumped onto the front foot right from the opening whistle. 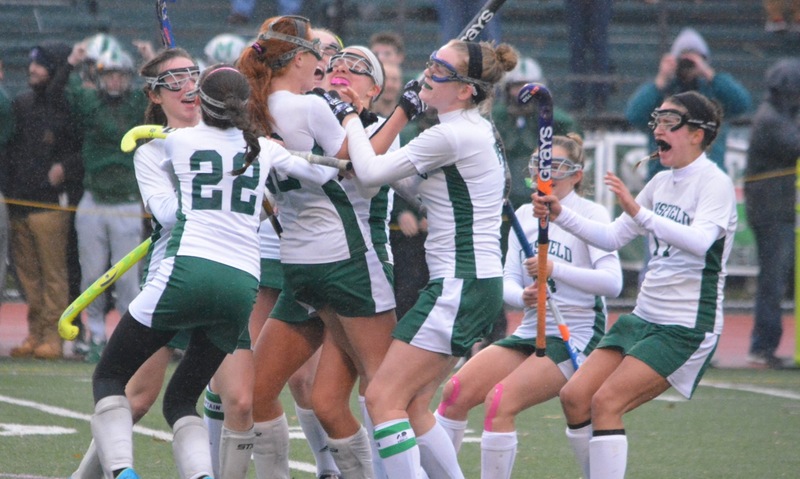 The midfield, led by Mackenzie Pleshaw, Diana Griffin, Dana Lewandowski and particularly senior Taylor Reutlinger, blocked off every Mansfield attack and kept the ball in the Hornets defensive third. Despite the pressure that Franklin was exerting, Hornets goalie Brenna Prior was largely untroubled in the opening half. The Mansfield defense kept Franklin at bay. Ann Maher, Amalia Todesco, and Jennifer McCabe forced everything to the outside and limited Franklin to only a couple of shots that got through to Prior. Pleshaw had the ball in the net for Franklin in the 17th minute but it was from outside the arc and did not count. Ruetlinger had a shot kicked aside by Prior and it started a break with Maher racing into the counterattack. A steal by Whitman forced Jones into a save with just two minutes before the break. Whitman had an early chance in the second half for Mansfield that was kicked aside by Jones and then Franklin went back on the attack. The Panthers had a second goal disallowed for a violation in the crease in the 34th minute and in the 42nd minute freshman Annie Walsh had a shot saved by Prior. Walsh had another chance in the 48th minute off a corner but no one could redirect her pass through the crease and the chance was gone. Six minutes later, Walsh again saw a shot find the side of the net not the back of it. “Everyone says defense wins championships, but you don’t win if you don’t score,” said Cropper. 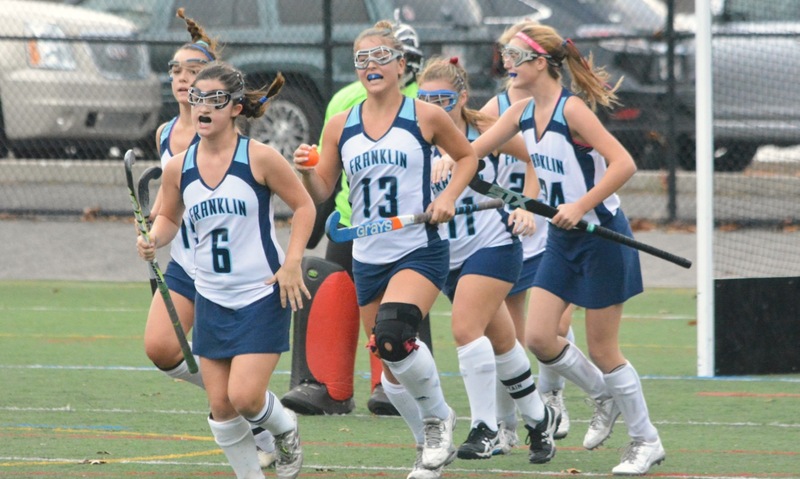 The Franklin midfield had been mostly impenetrable but as the clock wound down under a minute and the Panthers bench started making plans for overtime, the Hornets broke quickly. Julia Todesco found Caroline Maher with open field to run into for the first time all game and Mansfield turned it into a chance. Jones made several big stops but the play developed into a scrum in front of goal with both teams trying their best to get a stick on the ball. In the end, Jones was forced to cover up and the penalty stroke was awarded. The victory sends Mansfield to the Div. 1 South final at the expense of their rivals. Mansfield will face perennial power Walpole on Saturday at 1 p.m. at Oliver Ames.